iTunes now has a terms of service agreement that is 55 pages long. 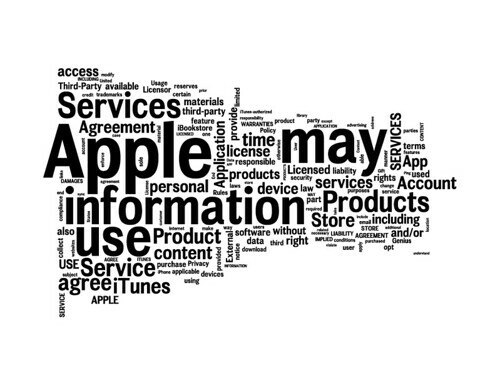 Dennis Yang created a word cloud with Wordle of the iTunes TOS in October of 2010. Here is another recent example of a SEVENTEEN section agreement customers must certify they’ve read and agree to, in order to create a user account on Disney.com and purchase park tickets online. I know “this is the way legal agreements work” now, but it seems ethically objectionable to me that as a consumer, I’m periodically forced to click a button which says, “I’ve completely read this agreement and agree to its terms.” How many people actually read, or have EVER completely read, the 55 page iTunes TOS agreement or Disney 17 section TOS agreement who are NOT lawyers? I’m betting very few. Yet “normal” in our current legal era has evolved to mean most consumers regularly LIE in clicking a box and virtually “accepting” terms which the corporation has the right to change at any time. These seems wrong at a basic level. I’m a fan of simple things which work. Why can’t corporations like Apple and Disney use a TOS similar to the following, short version? This is simple, in plain terms, and seems to lay out the facts of the corporate / consumer relationship in a much more concise way. for taking the time to read and comply. In many cases, the only option we have as consumers if we don’t like TOS agreements like this is to choose NOT to be a customer / consumer of that particular corporation. That’s not an option I want to choose, however. In the case of Disney’s online tickets, I found it IS possible to NOT join their online community to purchase tickets. It’s not possible to opt out of Apple’s iTunes TOS agreement, however, if you want to continue using iTunes. I’m unhappy with this kind of “you have no rights, click here to lie and indicate you’ve read and understand our exhaustive legal-ease document” situation. I don’t have a solution to this situation, however, so I guess this post is essentially a gripe. I’m sure some readers will say, “Abandon Apple!” or “Abandon Disney!” but I’m not willing to do that. This isn’t a problem unique to either of these corporations, we see ridiculously long TOS agreements elsewhere too. I wish there was a way for me to remain a happy customer but not be subjected to such legalese and forced virtual lying. This reminds me of Philip Howard’s 1996 book, “The Death of Common Sense: How Law is Suffocating America.” I’m glad to live in a society which is more litigious than corrupt (at least compared to some other countries where I’ve lived) but I wish we could do more to restore balance and sanity to legal situations like these which have become everyday occurrences for large numbers of people. Wes, I agree with you. I have been annoyed at those long TOS’s (as well as any legislation). I do not read them. I want to use the service so I just click “yes”. I think they should HAVE to come up with a 10-20 bullet point TOS. Thanks for getting the word out. I also do not spend the time reading the agreements and always just click yes. I’ve also noticed how long the apple service agreements are getting and it seems to me that they also update quite frequently. Every month or so when I download yet another app on my iPhone, I receive a message that the service agreement has updated and that I need to agree again before I can continue.